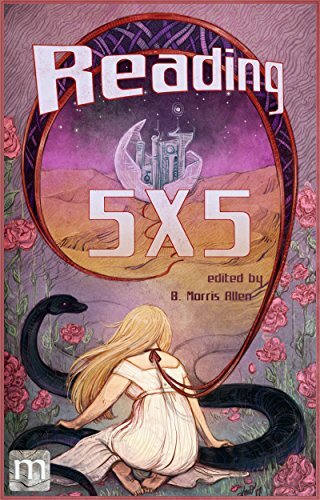 Of particular interest is Reading 5 x 5, edited by B. Morris Allen. The book was designed to provide insight into the process by which authors write to a detailed theme. Allen brought together 25 authors, grouped them by five speculative fiction subgenres, and for each subgenre provided a fairly detailed story brief. (His concept is described at the Reading 5 x 5 website.) Thus all five authors in each group started out with similar characters, settings, and plots. The resulting stories — most wildly divergent — are fascinating. I strongly recommend the writers’ edition of our book, with 100 additional pages including the original story briefs we worked from, authors’ notes for each story, and two additional stories. The editor and writers involved in the Reading 5 x 5 experiment agreed at the outset that proceeds from the book will benefit the Jo Clayton Memorial Medical Fund. Administered by Oregon Science Fiction Conventions, Inc., the fund assists professional science fiction, fantasy, horror, and mystery writers living Oregon, Washington, Idaho, and Alaska who need help with medical expenses.